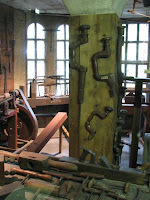 The Mercer Museum, in Doylestown, PA, houses an enormous collection of tools and other artifacts that were used prior to the Industrial Revolution. 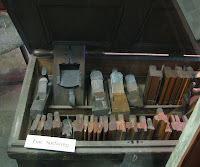 Among the exhibits are tools used by physicians, blacksmiths, clock makers, tinsmiths, cooks, cobblers, farmers, and woodworkers, in addition to many others; and collections of pottery, stove plates, painted chests, stagecoaches, boats, and much more. The castle itself is remarkable, filled with little alcoves, winding stairs, and a central atrium within which the largest of Mercer's pieces hang suspended in mid-air. The building is literally stuffed full of artifacts. Each floor surrounds the central and open atrium which provides a view to the floors above and below. Both the inside and outside of the castle are constructed with concrete. Even the muntins and mullions in the windows that afford views of each room's exhibit are made with it. Inside there are few sharp corners, mainly softened edges, even on the stairs; and arched entryways, rather than stiff and rectangular openings, separate spaces. I had never thought that concrete could seem so organic. Within the Mercer Museum is the Spruance Library, a research library open to the public, which preserves written material focused on Bucks County history, the history of trades and crafts, and the life of Henry Mercer. I have yet to visit the library, which no doubt, is worth a trip back to Doylestown. *After Mercer's death, the museum continued to collect tools and artifacts. Today, there are over 50,000 pieces in the collection, some of which may be post-Industrial Revolution.